The mania surrounding Girl Scout cookies has grown into a fever pitch in recent years, and cereal icon General Mills has capitalized on the trend by bringing us cereal versions of the two biggest cookie sellers in the line, Thin Mints and Samoas, known in some regions as Caramel deLights. The cereals were promised to appear nationwide in early January, but I've only just now found a box of Thin Mints cereal at my local grocer in March. There was no sign of the sister cereal, Caramel Crunch. My fingers are crossed that it'll pop up near me soon. So how was the Thin Mints cereal? Quick question: do you remember being a kid and seeing a commercial for Kellogg's Cookie Crisp, a cereal that touted itself (and still does) as chocolate chip cookies for breakfast? You no doubt remember the first time you plunged a spoon into a bowl of the little, light-brown rounds, eagerly anticipating the goodness of cookies and milk as a part of your well-balanced breakfast, only to discover that it tasted nothing like cookies and had more in common with puffed corn than a baked treat. Maybe you even convinced yourself that it tasted better than it actually did; the novelty of cookies in your cereal bowl was so overpowering that your mouth couldn't properly evaluate disappointment. Eventually, we all came to realize that we'd been had. Cookie Crisp wasn't baked goodness for breakfast; it was a fortified, vitamin-packed sham. It was a bowl of lies. Thankfully, General Mills' Thin Mints cereal fares better...slightly. The illusion that surrounded Cookie Crisp continues, however, because this cereal isn't composed of cookies. Furthermore, those of us who felt duped back in the day by Kellogg's are bound to have a similar reaction here. Stage 1) Anticipation - the excitement of opening the box, smelling the minty goodness (Mmmmm, MINT FOR BREAKFAST! ), and pouring a large quantity of the little brown "cookies" that slightly resemble animal droppings into a bowl. Stage 2) Taste - This probably goes something like "Wow, it's both chocolaty AND minty, just like the Girl Scout cookie!" this is followed by "Why does this have the texture of puffed corn instead of a delightful, cookie snap?" Stage 3) Realization - The slow dawning that you've been had. For some, this will lead to anger and frustration; perhaps they will throw the bowl into a nearby wall in outrage. Some will ritualistically set fire to the partially-full cereal box. The more proactive cereal fan will march back to the grocery store and demand a refund. Still others will quietly sob at the table as tears pool in their spoons, devastated by the knowledge that nothing will ever be the same again. Stage 4) Acceptance - Eventually, after much soul-searching, many cereal fanatics will reach the point of acceptance. No cereal will ever be as good as a cookie. By nature and by regulatory law, breakfast cereals have to have things like vitamins, nutrients, and whole grains, whatever they are, in order to get approved by the FDA and make it to shelves. Given that the government (aka "the gummint") is bent on keeping us from destroying ourselves at every turn, maybe this is as close to cookies for breakfast as we are actually going to get. 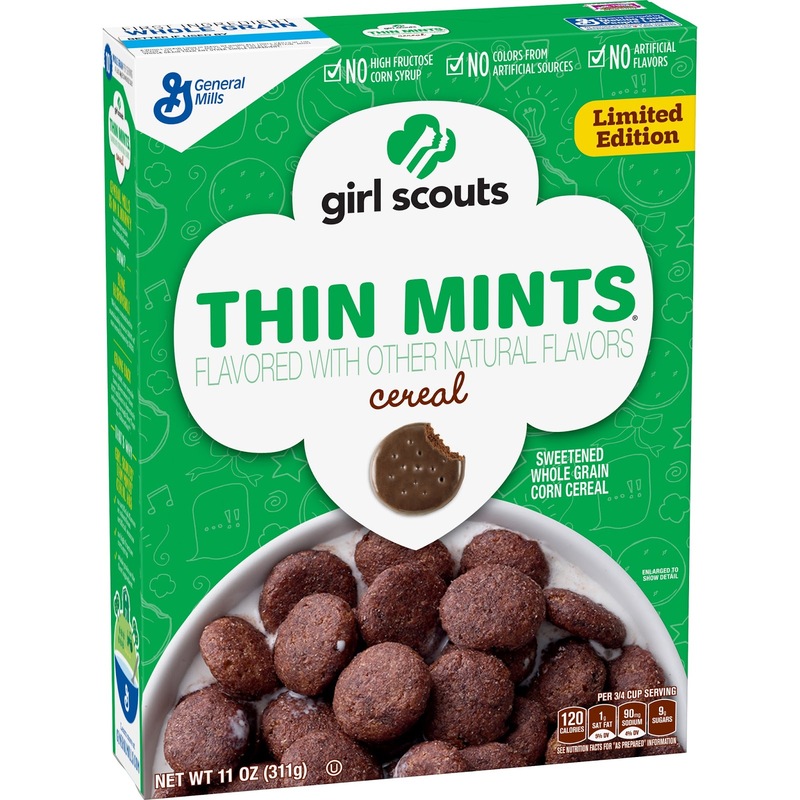 The reality is, Thin Mints cereal is actually pretty tasty on a palate-level. The chocolate flavor works well and pairs nicely with the mint. I can't quite explain why mint for breakfast is appealing, but I'll be snookered, it actually works. Also, because it has mint in it (or at least mint flavor), I believe that means you don't have to brush your teeth when you're done. For a puffed cereal, it holds its crunch for most of the bowl. If you eat cereal at a reasonable pace and can finish a bowl in less than ten minutes (sadly, certain members of my family cannot do this), you should be satisfied with the crunch-factor. There's a slight chemical taste that lingers after the cereal is gone, but it's thankfully not accompanied by the slimy film that actual Thin Mints leave in the mouth. Ultimately, General Mill's Thin Mints cereal is a novelty. The box is emblazoned with the text "Limited Edition," which leads me to believe that they are chasing the same seasonal success that the Girl Scout cookies themselves enjoy. This is the same marketing that has made everything from The Disney Vault to the McRib a smashing success; deprive consumers of anything, even something that isn't particularly spectacular, and we will likely buy it when it becomes available again. If they pull Thin Mints cereal from the shelves over the next couple of months and we have to wait until 2018 to pour ourselves another bowl, General Mills may very well be looking at their next big thing. Recommended...but buyers should be aware that, for a true cookies-for-breakfast experience, nothing can top pouring milk into a bag of Chips Ahoy.